When asked about how as President she would avoid investigations similar to the one compelling her resignation as Governor of Alaska she responded, "I think on a national level your Department of Law there in the White House would look at some of the things that we've been charged with and automatically throw them out." So why is this a ridiculous quote? For those just as unfamiliar with US government agencies as Palin, there is no Department of Law. A for creativity but F for not knowing what agencies actually exist in our government. As Putin rears his head and comes into the air space of the United States of America, where– where do they go? It's Alaska. It's just right over the border." "The America I know and love is not one in which my parents or my baby with Down Syndrome will have to stand in front of Obama's 'death panel' so his bureaucrats can decide, based on a subjective judgment of their 'level of productivity in society,' whether they are worthy of health care. Such a system is downright evil." "Well, let's see. There's - of course in the great history of America there have been rulings that there's never going to be absolute consensus by every American, and there are those issues, again, like Roe v. Wade, where I believe are best held on a state level and addressed there. So, you know, going through the history of America, there would be others but -"
"'Refudiate,' 'misunderestimate,' 'wee-wee'd up.' English is a living language. Shakespeare liked to coin new words too. Got to celebrate it!'" "They're in charge of the U.S. Senate so if they want to they can really get in there with the senators and make a lot of good policy changes that will make life better for Brandon and his family and his classroom." The first female governor of Alaska was Sarah Palin. Mrs. Palin was picked as John McCain's running mate in 2008's U.S. Presidental elections. Sarah Palin was born in Idaho and her family moved to Alaska when she was three months old. In her youth she became especially well known for playing point guard for Wasilla High School's 1982 championship team, and was second place in the Miss Alaska contest of 1984. She earned a journalism degree from the University of Idaho in 1987, then returned to Alaska and married Todd Palin, who was her high school boyfriend, in 1988. After a few stints as a TV sportscaster in Anchorage, Palin joined the Wasilla city council in 1992, then served as the city's mayor from 1996-2002. She became Alaska's first woman governor on 4 December 2006, after running a campaign based on ethics and clean government. Two years later, in a surprise selection, Arizona senator McCain made her the Republican Party's first female candidate for vice president. They were defeated by the Democratic ticket of Barack Obama but she kept in the public eye throughout the beginning of 2009, making high-profile trips out of Alaska and giving hope to her fans. She surprised her constituents when she announced on 3 July 2009 that she would resign in the middle of her first term as governor. Her resignation became official on 26 July 2009, when Lt. Governor Sean Parnell was sworn in to replace her. She published a memoir, Going Rogue, in November of 2009, and two months later announced a deal to appear on Fox News as a contributor. Days after her nomination as vice-president in 2008, Palin announced that her 17-year-old daughter, Bristol, was pregnant. Palin said Bristol would marry the father of the child, Levi Johnston, but Bristol Palin and Johnston later broke up. Their son Tripp, Palin's first grandchild, was born in December of 2008... Wasilla is located 35 miles north of Anchorage. 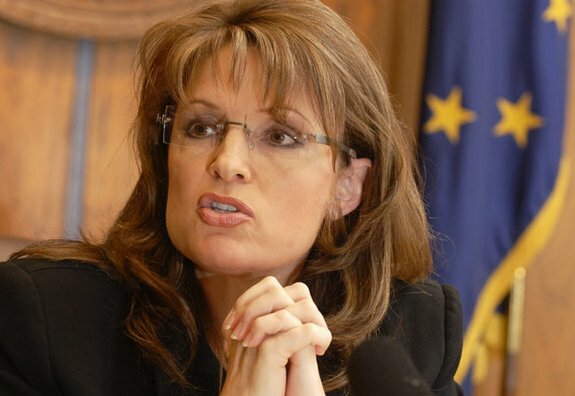 The city population was 7028 people in September 2008, according to the city's website... Palin's high school basketball nickname was "Sarah Barracuda"... The Palins have five children: son Track (b. 1989), daughters Bristol (b. 1990), Willow (b. 1994), and Piper (b. 2000), and son Trig (b. 2008). The dates were confirmed in a two-page health history published by her doctor, Cathy Baldwin-Johnson... Trig, who has Down Syndrome, was born while Palin was governor... Track Palin joined the US Army in 2007.